Kinshasa is the capital and largest city in the Democratic Republic of Congo. It is the third largest city in Africa after Cairo and Lagos and the second largest French-speaking city in the world other than Paris, France. Formerly known as Leopoldville, it was founded and named by Henry Morton Stanley in 1881 in honor of King Leopold II of Belgium who controlled the vast territory known as the Congo Free State. Kinshasa is located on the southern bank of the Congo River. With Brazzaville on the North bank of the Congo River, Kinshasa is the only capital city that faces another national capital. The combined population of the two capitals is approximately twelve million, with 10,076,099 in Kinshasa and suburbs in 2009 and an estimated 1.2 million inhabitants in its northern neighbor in 2007. Although 1881 is the official founding date, African villagers lived in what is now Kinshasa for hundreds of years. In the fifteenth century Kinshasa became an important center for Portuguese slave traders and merchants in what was then the Kingdom of the Kongo. The area began to grow when Belgian colonial officials arrived after 1881. In 1898 a rail line linked the coastal port of Matadi and Leopoldville, leading to the city’s rapid development. By 1920, when Leopoldville was named the capital of the Belgian Congo, it had a population of approximately 15,000. Leopoldville had slightly over 400,000 people when the Congo grained independence in 1960. The city like the countryside was soon divided by a five-year civil war. In 1964 Mobutu Sese Seko, the Army Chief of Staff, seized power and declared himself President of the nation. Mobutu provided a stable if often brutal government to the city and the nation for the next three decades. As part of his "Africanization" policy, he renamed the city Kinshasa in 1966, after the village of Kinchassa, which once stood on that site. 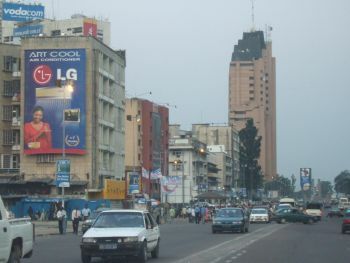 Kinshasa became internationally famous in 1974 when on October 30 it hosted the World Heavyweight Boxing title fight between George Foreman, the titleholder, and Muhammad Ali, the successful challenger. Although Kinshasa was also famous for corruption and violence during Mobutu’s reign, it continued to attract newcomers from throughout the nation. The city was the financial and manufacturing center for the Congo and the place through which most of the diamonds, copper and other natural resources were processed. It also became the major intellectual center of Central Africa with flourishing communities of musicians and artists. Even after Mobutu Sese Seko lost power in a civil war and fled Kinshasa in 1997 there has been little progress in rebuilding the economy and managing the large population increase. The city still grapples with severe unemployment and major health issues such as the AIDS epidemic. Kinshasa is home to the University of Kinshasa, Congo Protestant University and the National Pedagogy University. It also is the medical and media center for the Congo. Other institutions include a law school, an archaeological museum, a sports stadium and a tropical disease research center. Since the official language of Kinshasa is French, if present population trends hold, the city is expected to overtake Paris as the largest French-speaking urban area in the world in 2020. Theodore Trefon, Reinventing Order in the Congo: How People Respond to State Failure in Kinshasa (London: Zed Books, 2004); Elizabeth Heath "Kinshasa, Democratic Republic of the Congo," Encyclopedia of Africa, editors, Kwame Anthony Appiah, Henry Louis Gates, Jr. (New York: Oxford University press, 2010); CIA World Fact Book https://www.cia.gov/library/publications/the-world-factbook/geos/cg.html#top.